Desert wildflowers, originally uploaded by The Bacher Family. 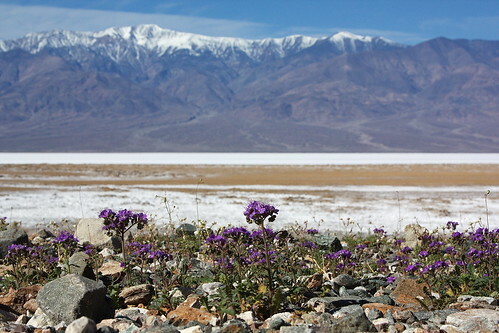 The abundance or scarcity of wildflowers in Death Valley National Park has everything to do with rain... or the lack thereof. Not only does it need to come in the right quantities, it needs to be at the right time. This year, the desert had plenty of rain in November, but when February came around the weather stayed dry. We saw quite a few wildflowers, purple and pink and yellow, but nowhere near the abundance of some years. This beauty was right beside the road, enjoying a bit of protection from the dessicating winds among the rocks, with a gorgeous view of the valley and the distant mountains beyond.